The “INDIGENOUS FAITH & CULTURAL SOCIETY of ARUNACHAL PRADESH” (IFCSAP) executive members consist of Bai Taba Secretary General, Lod Kojee Vice President (W), Gichik Taaza Vice President (HQ), Take Dakpe General Secretary (HQ) and Nyasam Jongsam Secy. Information & Publicity, called on Governor of Arunachal Pradesh on Thursday at Raj Bhawan, Itanagar. 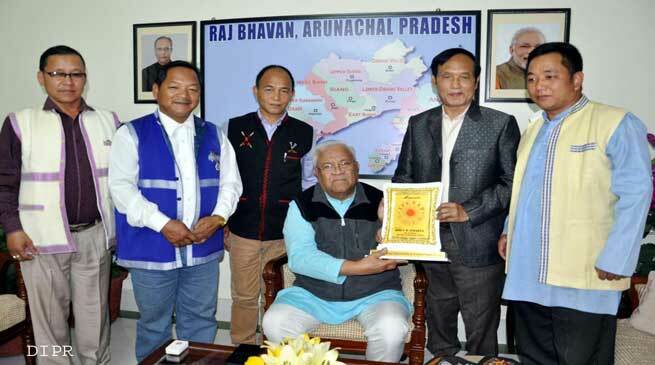 The visited team had a long discussion with, Governor of Arunachal Pradesh on various issues like establishment of Schools for economically backward section of the society, opening of Vocational Training Centre for indigenous youth and women of rural areas. And also works on preservation, promotion & protection of indigenous faith and culture as well as promotion of rural development programme like Rural India through Sustainable Development Projects, Training and Entrepreneurship Development to promote rural indigenous arts and handicrafts entrepreneur and create a platform for youth to take up as income generating activities in village level in Arunachal Pradesh. Governor has also suggested to get registered with North East Zonal Cultural Centre (NEZCC), Dimapur, Nagaland for exposure of Indigenous Cultural activities like folk song, folk dance etc. and he emphasis to organize workshop on moral values and reformation of social evil prevail in the society. Governor has assured to extend all possible help to IFCSAP in the endeavour to promote, preserve and protect the indigenous faith movement particularly in Arunachal Pradesh and India as a whole.